I realise we are a bit late and January 2018 is nearly over so please accept my apologies but Lincs Carpet Cleaning has had a very busy December and January. I can not complain as its always good to have lots of jobs and lots of happy customers. In December we were called to a property after a call from an unsatisfied Landlord after the tenants got the carpets cleaned at the end of their tenancy. They had used another cleaning company from Lincoln to clean the carpets at a property in Highfield Avenue. They’re prices were unbelievably cheap, but unfortunately for them the cheaper the company it is likely the standard wont be as good. This Ltd company apparently flew round the property in Highfield Avenue in Lincoln and barely cleaned the carpets at all. The grill pan wasn’t cleaned in the oven and the handle had mysteriously disappeared. The landlord added that the carpets had been left “soaking wet” this most likely meant that no extraction process had taken place. To leave the carpets this wet and soggy had left an awful damp smell and meant that the dirt in the carpet had just been washed around and not successfully removed. 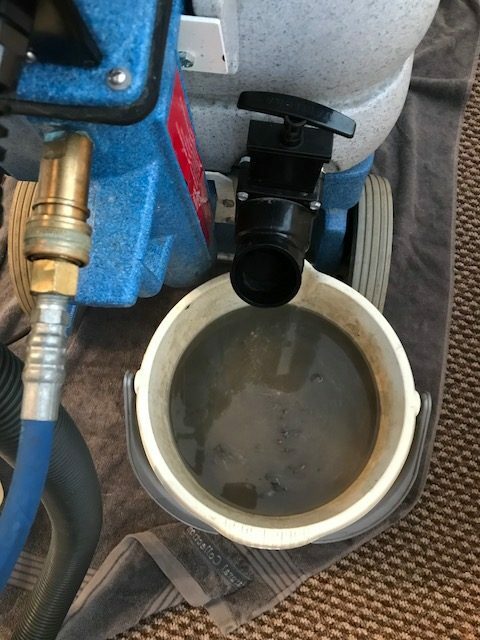 Lincs Carpet Cleaning cleaned the carpets and we even took a picture of the disposal of the waste water so people could see that this company had left a lot of dirt in the carpets. Please people remember if its really cheap the service may not be that good. I love to be savvy with money like the next person and I do love a certain money saving website 🙂 but if it seems to good / cheap to be true then it probably is. I hate to see people out of pocket and I just hope that these ex-tenants take the matter further, as that’s no way to do good business and the other company should be ashamed of themselves.